A: a place full of oak trees, oak-land, became Auckland over time? B: the large population of Orcs which used to live there - some of them went on to feature in Peter Jackson's Lord Of The Rings films? C: the Earl of Auckland, George Eden, First Lord of The Admiralty and the patron of William Hobson who established the British colony of New Zealand? D: it was the first place where the term "Awks" was used in anger, by a young, text-speak-type-person e.g. "I went in the Kiwi and Possum last night with Dan, and we bumped in to Shaz... awks!"? Well done if you said "C". It was named after George Eden, Earl of Auckland (in the North East of England, though George was from Kent). Eden Park, Auckland's cricket and rugby stadium also got its name from George. Auckland is also known as "The City Of Sails", due to the number of posh yachts there are here. To get a look at some of the posh yachts, and also to see a bit more of Auckland, we boarded a ferry which took us the very short hop across Waitemata Harbour to Devonport, a quiet suburb with shops and hotels in the style of many English Victorian seaside towns. Devonport is also home to the New Zealand Navy and a small number of fortified gun turrets which were built to defend against invasion by Russian warships. 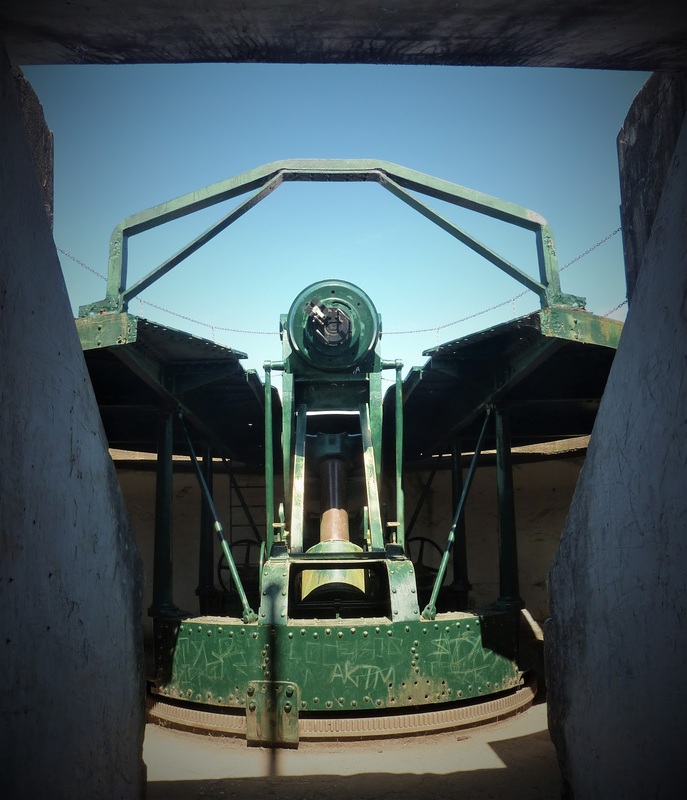 At the top of Mount Victoria we saw a "disappearing gun", which, when fired, would disappear back underground allowing it to be reloaded whilst hidden. 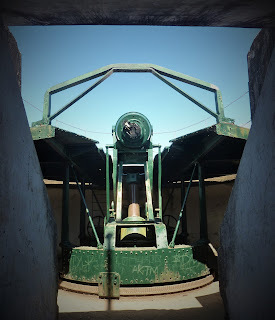 Unfortunately (or fortunately, depending on you point of view) this gun was only every fired once, to test it out, and the noise cracked so many windows in the area that the residents complained and it was never fired again. The whole "Russian threat" thing seemed strange to us - we weren't aware of hostilities between Russia and New Zealand. Apparently, in 1873, the Daily Southern Cross newspaper reported that a Russian warship "The Kaskowiski*" had sailed into the harbour, attacked and seized a British ship, then captured many prominent Auckland officials and stole cash and gold from the city's banks - the story prompted panic and terror. However, it was fake news - completely made up, by the politically motivated editor in order to provoke fear of attack by foreigners into his readership and, as a result, support hugely expensive and ultimately pointless actions, such as building useless gun fortifications, across the region. Imagine if, in this day and age, one of our newspapers printed lies in order to scare and manipulate people into supporting policies which were damaging to our country - we'd never fall for that, would we? 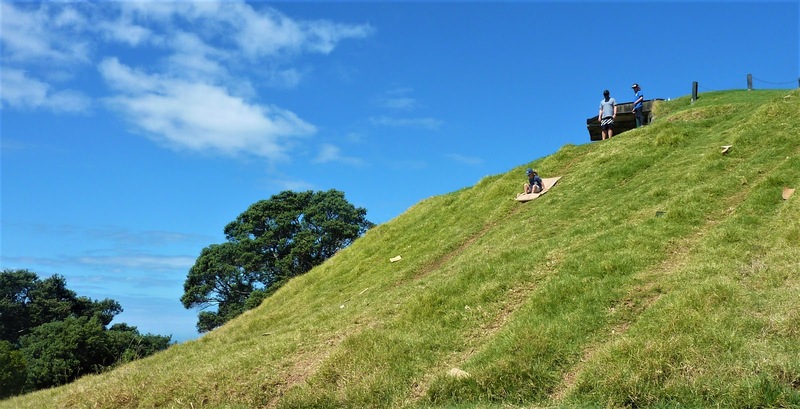 On the way back down from another one of these unnecessary gun forts, we witnessed our first example of New Zealand's second most popular sport**. Cardboard sledging. Two little kids were sitting at the top of the hill on sheets of old cardboard, then bouncing down the grass slope screaming and laughing all the way to the bottom. It looked like good fun, but when their dad suggested we had a go I muttered something about bad knees and back, and we scuttled off, towards Cheltenham beach. 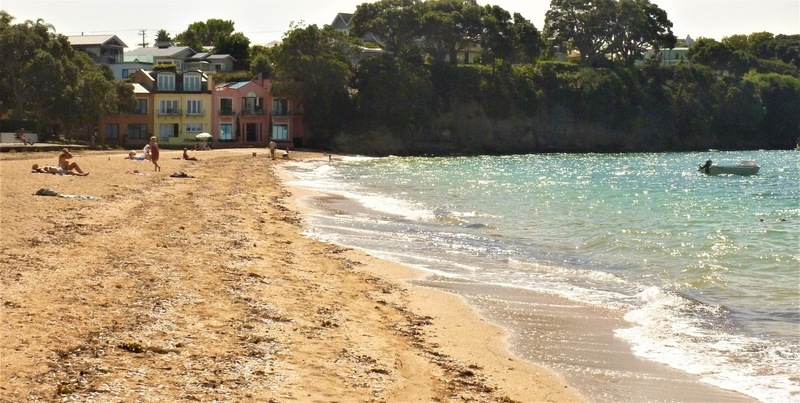 Cheltenham beach is a very genteel strip of sand, lined with well kept little houses, separated from the beach by neat little lawns. There are no fish and chip shops, no amusement arcades and there were signs every now and again warning us that no drinking is allowed - this is NOT the "Blackpool of the Southern Hemisphere". 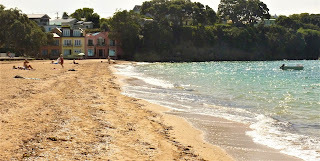 We both went for a swim in the sea (very unusual for me, I prefer to sit and watch other fools get cold and wet while I sip a beer, but that wasn't an option) and I must admit, it was quite pleasant, once the shivering had died down. On the way back to the harbour we saw police cars arrive at a very unassuming bungalow on the quiet street we were walking down. A news story later, suggested they were armed police who were following a tip off of a man acting suspiciously (not me, honest). In the aftermath of yesterdays events in Christchurch, tensions are understandably heightened. * Cask Of Whiskey - I didn't get it a first either! ** We'll talk about New Zealand's number 1 sport later, but I'm sure you can all guess what it is. In Auckland, you can't miss the Sky Tower - it's massive. It was opened in 1997 and at 328 metres high, is the tallest freestanding structure in the Southern Hemisphere. And tonight we're going to be eating at the top of it, following a recommendation from our next door (15 minutes walk away) neighbours, Sam and Mark. A ticket to go up the tower costs $32 (about 16 quid), but for an extra $53, you get a 3 course meal in the swanky revolving Orbit Restaurant. Sounds good, as long as you're not afraid of heights! As we entered the lift and pressed the button to take us to the 51st floor, I could tell that Jus wasn't entirely happy. The lift only takes 40 seconds to zoom up to the top - the display telling you which level you're on flickers from number to number in a blur. It has a glass wall so you can see the buildings fly past, until very quickly there are no more buildings because you're higher than them. It also has a partly glazed floor, and the floor (i.e. the bit of ground we were previously standing on) gets further and further away pretty quickly if you stand on this window and look down. Justine was definitely not standing on the glass floor (memories of the last time she stood on a glass panel at the Coal Mining Museum in Wakefield, and her rather fruity language which left some former coal miners quite shocked, are still too raw). She wasn't keen on looking out of the side of the lift either - that was reminding her of the infamous Eiffel Tower lift experience. Instead she chose to focus on one of the uninteresting lift walls which gave the least indication of the speed we were moving at, or the altitude we were achieving. We had a few minutes on the viewing platform which allowed me to look at the various viewpoints and take photographs, while Jus gingerly picked her way around, being careful not to get too close to the windows in case she fell out! I know she doesn't like heights, but this tower is only slightly higher above sea level than our house, and she don't usually get vertigo looking out of our windows. Then it was time to go up a couple of floors to the restaurant. 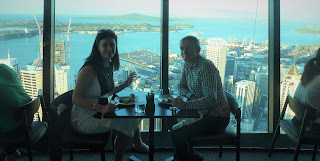 We had a table for two right next to the windows and while the floor rotated us 360 degrees per hour, we enjoyed a fantastic meal. Afterwards we were able to return to the viewing deck and see the city at night. 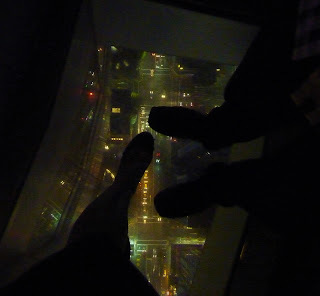 I was also able to persuade Jus to join me on one of the glass panels in the floor, and amazingly (perhaps a few glasses of wine had helped), she did... without swearing!!! Thursday evening and we're on our flight from Hong Kong to Auckland. Things have moved on since our last long-haul flight. The entertainment system in our seats gave us the opportunity to learn Japanese, do guided meditations, learn about New Zealand wines, do a quiz or watch more films than one could shake a stick at. Normally on a Thursday night we'd be at The Moss Trooper with the mighty "Thanks For The Lend" Speed-Quizzing team, so we opted to take the quiz, whilst flying over the Philippines, at over 500 miles per hour - the ultimate Speed-Quiz. We did OK, though we were let down by our lack of knowledge about Kiwi TV celebrities. After the quiz, and a bit of sleep, I binge-watched music documentary films - Montage of Heck (Kurt Cobain) and The Man From Mo Wax (James Lavelle, founder of Mo Wax records) - both excellent. Justine, on the other hand, opted to learn Japanese (the massive swot). So she can speak Japanese, very impressive... but does she know that the first LP released by Mo Wax was The Jazz Hip Jap Project compilation? That's the kind of knowledge that wins quizzes mate, not knowing how to speak other languages! On our arrival at Auckland we had to fill in our immigration forms. Now we've got previous when it comes to entering countries round these parts. Some of you may recall the tale of Bouncer, the Australian sniffer dog who thought we were trying to sneak apples into his country. Well I'd done my research and knew that New Zealand Customs were very keen on not bringing stuff into their country which might have an impact on the environment, including soil, so I'd been really careful to clean the soles of my walking boots before we left the UK. But on our immigration form we had to tick a box to say whether we had any kind of outdoor equipment, including shoes, in our luggage. Did I have shoes in my case? Yes, I did. Do I really have to declare them? Well the signs warning me of a $400 fine for not declaring something were enough to convince me that I probably should, so I joined the "Something to declare" queue, ready to declare "my shoes". The customs officer was really friendly and didn't seem too worried about me being in possession of shoes, so a quick suitcase X-Ray and we were through. But then, directly ahead of me, I spotted it - my worst fears had become reality. A small, cute (but don't let that fool you) puppy... let's call him Wellington. I had flashbacks to the harrowing events in Australia. What if Wellington detected peach residue in our bags, or even worse, that Jilly Cooper book I had in my rucksack, just in case the flight got really boring. Thankfully, Wellington strolled right past us, without a second sniff, and instead started barking at the nice Columbian gentleman who'd been behind us in the queue. Wellington seemed really interested in the gentleman's 6 suitcases of flour. I assume he must have been a travelling baker. And so, it's time to leave Hong Kong and head off to New Zealand. Our flight was due to leave at around 5pm, so we still had most of the day to do last minute Speedtouring. Dragging our cases around would be a pain though, but that's not a problem. The transport system is so joined-up that at Hong Kong Central Station, there's an airline check in desk. We were able to check in our cases, got our boarding cards and then were free to roam the city - you can't do that at Macclesfield station! Unfortunately it had now started to rain quite heavily, so, after a quick stop to grab pasties at Hong Kong's equivalent of Greggs, we wandered around the Museum for a couple of hours and got ourselves a bit more educated. We learned about The Opium Wars, and how Hong Kong came to be leased to the British, the trials and tribulations which followed, including the brief occupation by Japan during World War 2 and the handover of control to China in 1997. It probably would have been useful to understand some of this at the beginning of our stay here, things might have made more sense, but hey, that's not how Speedtourism works! 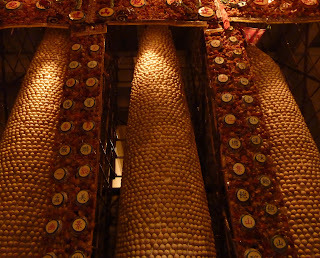 We also learned about about the Bun Festival, a part of which was the Bun Snatching event. Young men would climb a 60 foot tower of bamboo scaffolding, covered in buns, and attempt to grab as high a bun as possible. This continued for many years, until, in the late 70s, one of the towers collapsed and over 100 people were injured. 3 bun towers were on display in the museum, and I considered scaling one, to grab a quick barmcake, but I was still full from my Greggs pastie, so I decided not to bother. 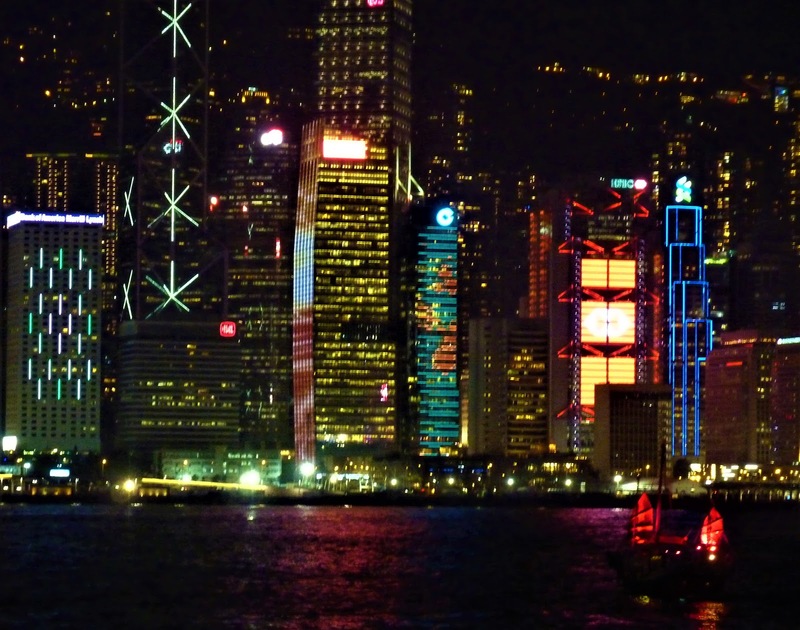 Every night at 8pm the Hong Kong skyline is brought to life with a sound and light performance, much like the Blackpool Illuminations, but without the stag parties and hen nights. In theory we should have experienced this from the top of The Peak last night, but we couldn't hear anything from up there. So tonight we found ourselves a space, perched on a handrail, amongst the crowds on the Kowloon side of the harbour and watched as the skyscrapers flickered and glowed across the water. As the music started we realised why we couldn't hear it from a mile a way on top of a hill - we could barely hear it from here. Maybe they have to keep the noise down so they don't upset the neighbours. Still, as a couple of red-sailed junks bobbed across the water and the lights and quiet music did their thing, it was a pleasant enough way to spend 10 minutes before taking the ferry back across the harbour. 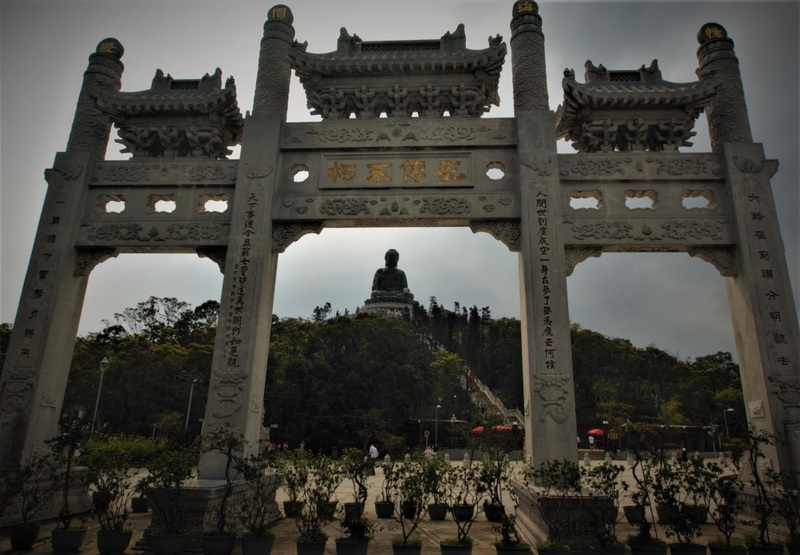 Day 3, and we took a ferry to Lantau Island, to see the Big Buddha. It's a statue, of Buddha... and it's BIG! 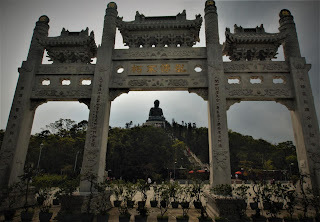 From the bottom of the Buddha's stairs you can take a short walk through the woods along the "Wisdom Path". At the end of the path is a hill with 38 huge wooden pillars, arranged in a figure of 8 infinity symbol. 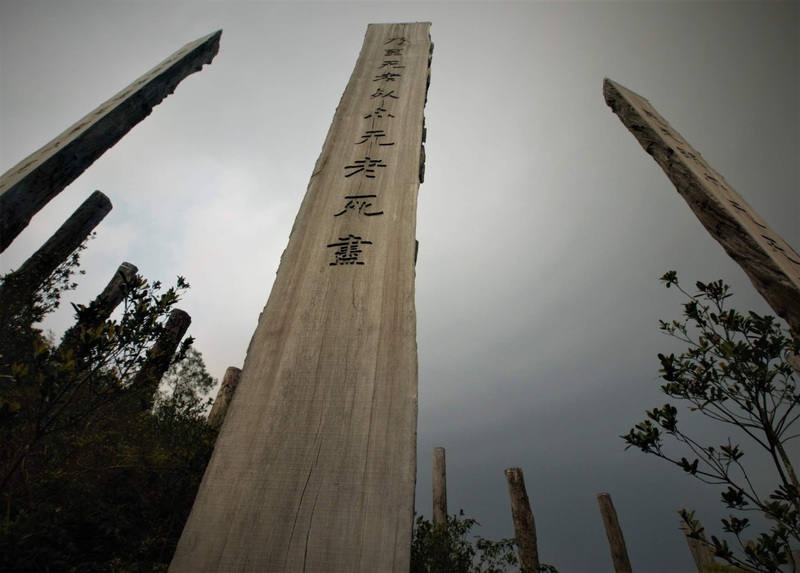 All but one are engraved with verses from the Heart Sutra. We loved it and left feeling both earnest and wise - whereas usually I feel more Eric and Morecambe! On the way back we ended up at Tai O fishing village, where Justine decided we should try another of the interesting streetfoods on offer. This time Fishballs! 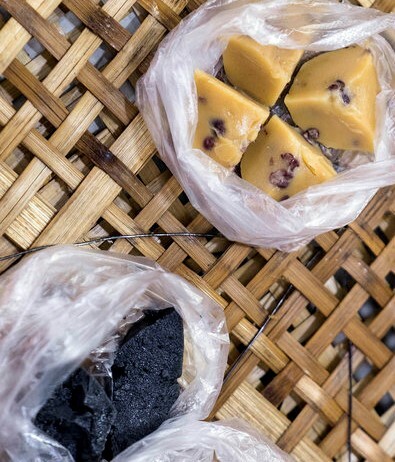 All I can say is, if you're passing through Tai O and someone offers you a spicy fishball on a skewer, and you're not a massive fan of rubbery snacks which cause you to lose the ability to taste (or breathe), then perhaps give it a miss. We slept like logs, whatever that means. I mean, logs are just bits of dead tree, so basically, we slept like bits of dead tree, but in a nice bed in a nice hotel, with a coffee machine and a flat screen TV and a view of the harbour and a wardrobe to hang our bark and our leaves up... see this is what jet-lag feels like. Anyway, on with the trip. We had breakfast in a little place we'd seen on Trip Advisor which was near our hotel and sounded more authentic than Starbucks. We found a table and looked at the menu, which, quite reasonably, was full of strange Chinese symbols. If Ready Brek or Frosties were an option on this menu, I certainly couldn't spot them. The nice lady who came to take our order could tell we were confused and brought some special menus for us, which had the options in English. Still, no sign of Coco Pops though! So instead, Jus ordered condensed milk buns and a red bean and coconut ice smoothie (which was lumpy) and I had rice noodles in a ginger and spring onion broth, with a couple of fried eggs on top, and a cup of coffee with condensed milk... they really like condensed milk here. Now admittedly, this was no Weetabix, but it was all rather nice and we ordered more bits and bobs before moving on after a very filling, and cheap, breakfast. After our breakfast, we took the Star Ferry over the harbour and joined a walking tour in Kowloon which dramatically demonstrated the difference between the shiny global financial centre of Hong Kong, and the day to day lives of people born here. Our guide took us on a tour of the sights which you wouldn't normally see. (ii) space is so scarce that if you want a pet, a goldfish doesn't need much floor area to run around in. We saw the Bird Market, full of caged birds which are sold by, and to, an elderly section of the Hong Kong population. Keeping birds used to be a popular activity and people would take their cages out into the parks, or bars and hang them on hooks while they socialised with their friends, and the birds socialised with each other. This hobby is less popular with younger people, partly from an animal-rights point of view, but also since the first occurrence of the H5N1 virus (bird flu) transferring to humans was recorded here in this very district of Hong Kong in 1997, there has been an understandable drop in enthusiasm for bird-keeping. We learned about the lack of space for housing and the various political and economic forces which had created a situation in which this country is the least affordable place in the world to buy a house. We visited a room above a laundry which was 10 square metres, just enough room for a bunk bed and a small table with an electric hotplate - no bathroom, and though this had a tiny window to let some air in, some internal rooms didn't even have that. The rent per month for this would have been 80% of the average person's salary. Some people have resorted to renting cages to live in (because they're cheaper), or even "coffin rooms" which are just big enough to lie down in. We've seen much, much poorer people on our travels, but they've either been poor countries or ones with "unusual" regimes. This is a hugely successful nation with a higher GDP per capita than that of the UK, but most of the population can barely afford to live in it. 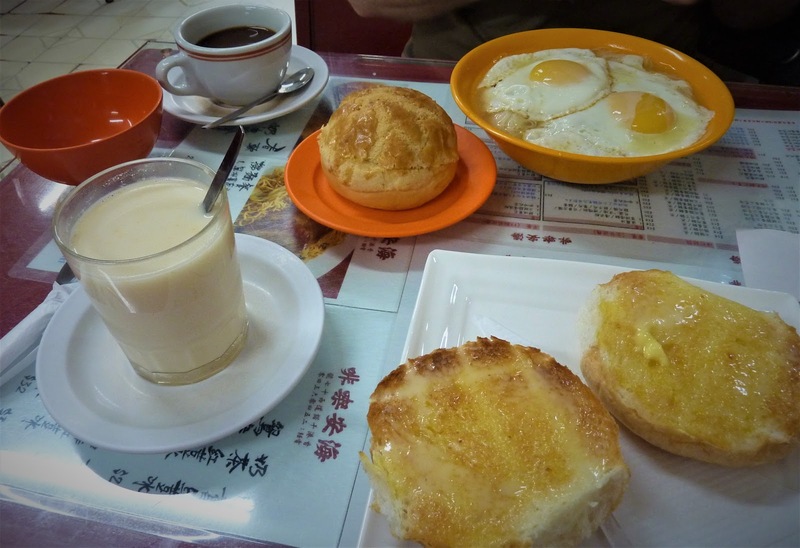 The tour ended in the middle of the Sham Shui Po district, and we went into a small café where we were squeezed on to a table with locals who were tucking in to bowls of noodles. We ordered something from the menu and two large bowls arrived, filled with broth and with dim sum parcels bobbing on the surface. The total cost of our evening meal, £5.60. 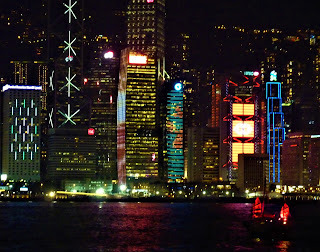 Later we returned to Hong Kong Island and visited a few bars. Our final stop was J Borowski, a bar we'd seen in a guide book and had caught our eye thanks to the amazing interiors created by industrial designer Ashley Sutton. Having just visited Iron Fairies a few doors up the road (another of his designs) which had hundreds of cast iron fairy figurines, scattered around the tables, and what can only described as mini furnaces with comfy seating benches inside, we felt we needed to see more. This time the bar's curved ceiling and walls were decorated with hundreds of beetles - not John, Paul, George and Ringo - no, these were Steel Scarab Beetles (maybe a Fab Four tribute band from Sheffield?). While Iron Fairies had been dark, busy and pumping with loud music, J Borowski felt quieter, more grown up, sophisticated. The barman explained that they don't have a cocktail menu. 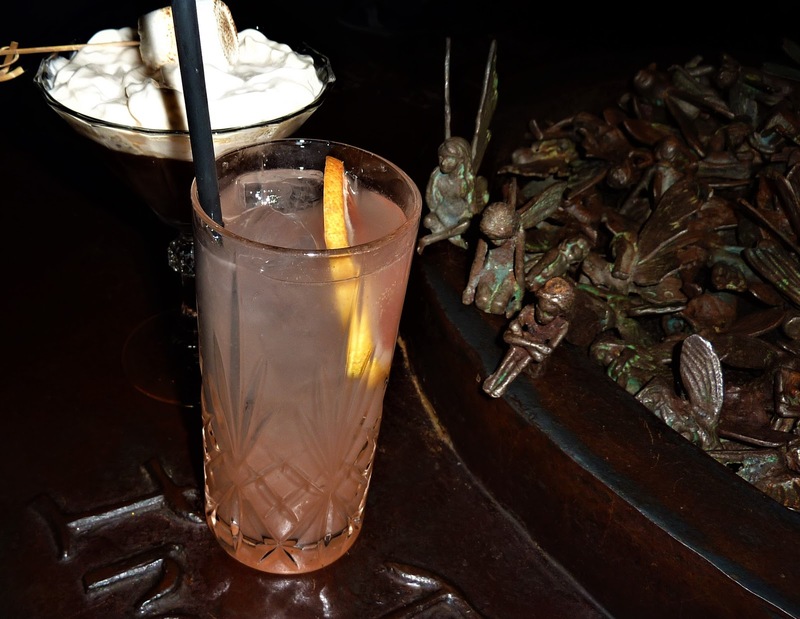 He simply asked us to describe the sort of things we liked and he would create a bespoke drink for each of us. Jus said she liked "chocolate, vodka, cream, men with a good sense of humour, Scandinavian design, and gin " but didn't like "whiskey or coffee or red wine or carrots or Michael McIntyre". I told him I like "dark rum, coffee, smoky (not Smokie, the band) whiskies, hoppy American style IPAs, port, gin and Radiohead", but don't like "tequila, absinthe, mango, liver, reality TV shows, Veuve Clicquot or John Smith's Extra Smooth". 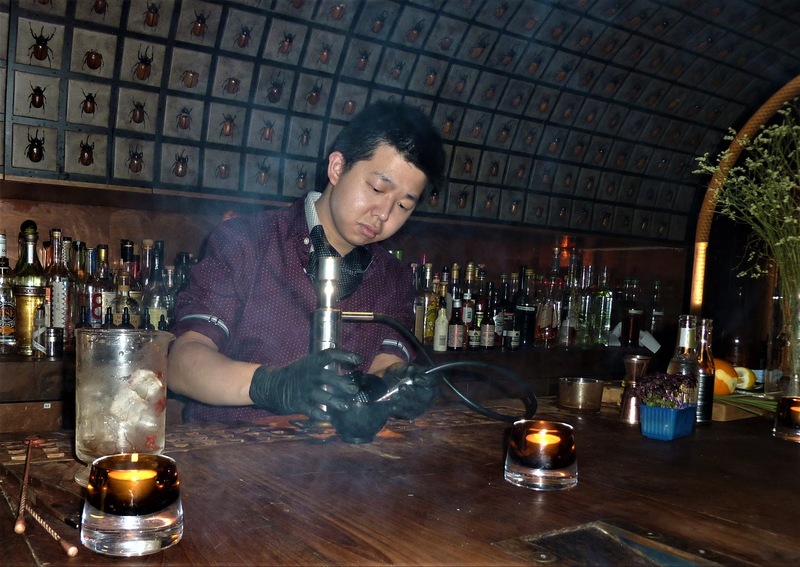 From this brief, getting to know you session, our cocktail psychologist was able to assess the precise ingredients for our perfect beverages and got straight to work. 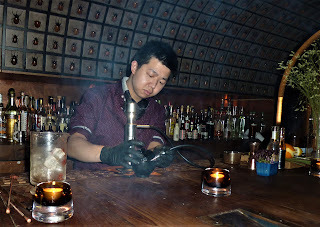 As we sat and chilled out to the down-tempo acid-jazz beats, we watched him scurry back and forth picking bottles, sniffing their contents, adding and stirring, sometimes pouring only the tiniest drop, tasting every now and then until after about 10 minutes of pure entertainment, Justine's cocktail was done. He disappeared in to the back and Jus tried her drink. She thought it was quite nice! He then reappeared with a freshly microwaved espresso and proceeded to build my drink. He melted some chocolate into the coffee, he added some whiskey, some chartreuse (I think), then it all got a bit difficult to follow. There was pouring from a height into a different vessel, and then back again presumably to strain it or aerate it, or just to look good. It might have had a bit of jam stirred in at one point, it was hard to tell, but finally it was poured into a little pot with a lid and then smoke blown through it with a custom-made mad-science smoking device. I was told to keep the lid on for a few seconds, then removed it and tasted it. It really was very good and didn't taste of liver or mango at all, but to be honest, even if it had just tasted like a Baileys with ice, the whole experience would have been worth it. Following our adventures in the US, Australia, Vietnam and so on, we're off on another trip, this time to New Zealand. The flight was via Hong Kong, so obviously we were going to take advantage and spend a few days there (a luxury, compared to a few of our "24 hours in..." tours). Our trip started with a post-panto-party dash to Timperley. We went to bed at 2am, got up again at 8am and headed to the airport. On our arrival (8am HK time, midnight UK time), we checked in to the hotel, and went straight out Speedtouring™. We had a map and set off to explore. However, large parts of Hong Kong were being dug up and we kept finding ourselves unable to get to things. Add to that, the fact that the roads are busy and it's often not obvious how to get to the other side, and we were not making great progress, though to be fair we did manage to see 3 or 4 of the city's top building sites! We had Octopus Cards (the equivalent of Oyster Cards) which were excellent and so we hopped on one of the vintage-style trams which allowed us to get a better look at our home for the next few days, and as we started to get our bearings it became easier to get around and we spent the day ticking off some of the sights. One of the main attractions is the skyline - the lack of building land means everyone has to build upwards and one of the "must do" items for visitors is to go up "The Peak" (HK is surprisingly hilly) on The Peak Tram, a funicular railway. Unfortunately, the fact it is a "must do" means that everyone "must do" it and therefore the queues can be long. When we arrived at around 5:45pm, it looked like everyone "was doing" it. The queue (snaking back and forth under the bypass) looked horrific, but having made so much effort to get there we joined the back... and waited... and waited. Every now and again, a small batch of people were allowed across the road to join the other queue in the tram station. It became clear that priority was given to anyone from an organised bus tour, or who had purchased tickets for Madame Tussaud's (at the top of the hill?!?). The queue moved very slowly and on at least 4 occasions we discussed giving up and leaving. But the longer we stayed, the more reluctant we became to throw away the time we'd already invested, so we stuck it out. After over 90 minutes we were near the front of the first part of the queue and almost ready to cross the road to get into the next queue. At this point, it became clear that there was another way to jump the queue, which was to suddenly appear in it as if you'd been there all along. I looked at the guy in front of me and thought, "hang on, he wasn't there a minute ago". Then he called his wife over, so she could push in too. Well, the politics of the last couple of years has, at times, left me feeling ashamed to be English, but, if there's one thing I do still believe in it's a properly observed, dignified, traditional English queue. I made it my sole objective for the rest of the evening to ensure that this couple did not, under any circumstances get on that tram before us. We managed to get back in front of the queuebusters as we crossed the road, and joined the next queue (we could almost see the front of it now), but as we got closer to the platform, things spread out a little and I was struggling to hold off my competitors. I tried to make myself as wide as possible, but it was no use - these guys were clearly experienced queue-cheats and I just wasn't in their league. One of them sold me a dummy and that was it, they were past us, I'd lost! We finally got on the tram after 2 hours in the queue and started to crawl up the side of The Peak at what felt like a 45 degree angle - the high-rise buildings on the side of the hill seemed to be toppling over as we looked out of the window. After 10 minutes or so we arrived at the top and (ignoring Madame Tussauds and the various tacky gift shops) we walked out to look at the view below. It was dark by now and it became clear why this is a "must do". We were high above even the highest skyscrapers in the city below and the view was spectacular. Eventually we'd enjoyed the view enough and decided to make our way back down. Then we saw the queue for the return tram - it looked like we could be waiting another 2 hours! Forget that, we'll walk down, how hard could it be? So we set off along a footpath where a few other people were walking, but after 10 minutes, we realised that we were starting to go upwards - that can't be right. A bit of Google Map checking confirmed that we'd misunderstood the signs (a common problem for us in Hong Kong) and were actually doing a circular nature walk around the top of The Peak, in the dark. We could hear "the nature" but couldn't see much of it, so turned around and went back to find the actual road down the hill. To be honest, even with our detour and the walk back down the steep hill, it was probably quicker than queuing for the funicular, and eventually we arrived back at our hotel at 11pm. We'd been going for 30 hours without sleep, sustained on a diet of seaweed and crab chilli crisps - hopefully after a good night's sleep we could resume our Speedtour.